The lure of this home for the current owners was its proximity to their older parents and its dramatic location on the Puget Sound. Originally built by Robert Durham of Durham, Anderson, and Free, this complete remodel created an open floor plan with a modernist feel that includes an exposed structural steel frame and amazing windows to optimize its shoreline site. Extensive new cabinetry, steel fireplace fronts, and stunning new finishes and fixtures complete this remarkable remodel. This elegant Mercer Island rambler features fine detailing at each turn. The original 1980s rambler was completely renovated, inside and out. All the interior walls were altered and taken down to the studs. All exterior surfaces, with the exception of the roof, were also removed and reconstructed. This project came in on budget and within the projected move-in date. This 70s home needed updating. Starting with the kitchen, living room, dining room, and great room, we creatively removed some load-bearing walls and restructured framing. Then came very original solutions for two boring fireplaces. In the existing space we re-designed the functionality and established a more spacious layout. Custom Ribbon Sapeli contemporary cabinets, hardwood floors, fabulous countertops, and new appliances helped us reinvent this amazing kitchen. A must see! Every foot of this classic 1960s Northwest home has been exquisitely transformed into a midcentury modern masterpiece. Timeless details, original and new, exist throughout the 5,200 square foot home featuring an award-winning kitchen and five baths. Custom furniture pieces and incredible interior elements complete each room. Outside, you’ll find hand-split cedar siding and soffits, splintered basalt masonry, and Ipe wood decks. Stroll around the lush garden featuring an in-ground spa, cave, waterfalls, and Koi pond. 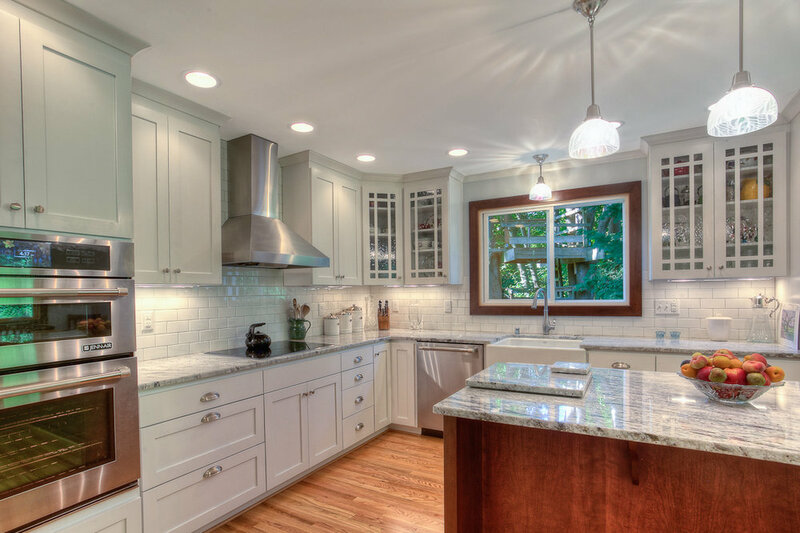 Classic and modern blend beautifully in this updated 1941 kitchen. Originally the ample space was underutilized. By redesigning the kitchen layout and adding a well-placed island for gathering and extra seating, the flow and efficiency make this kitchen the star of the home! Vintage touches include a farm sink, cup pulls, white Shaker custom cabinetry and subway tiles which sparkle next to modern updates of granite countertops and stainless steel appliances. With just two bedrooms and one bath, this modest 1950s tract house was space enough for this couple to keep their life uncomplicated between their many outdoor adventures. But these lovers of pared-down efficiency and its inherent design beauty realized their home needed work. 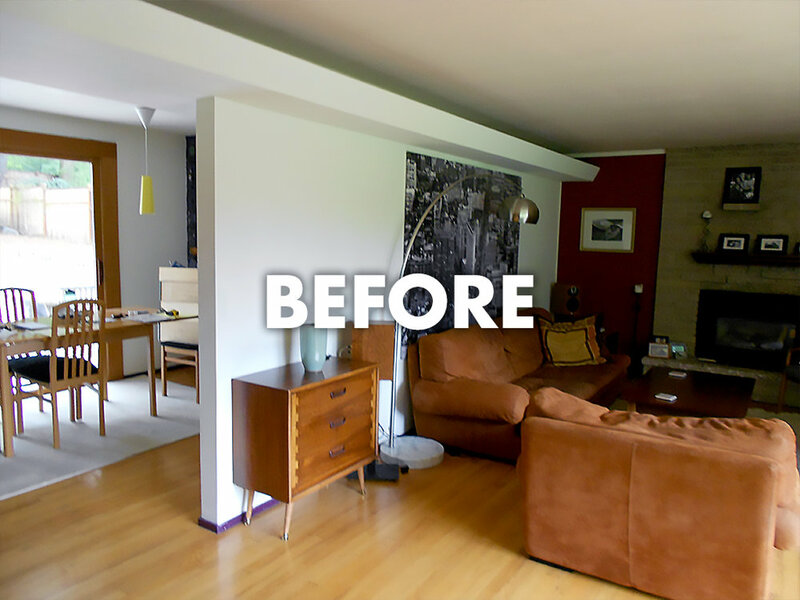 Capitalizing on its mid-century modern potential, walls and fussy trims were removed. The house now breathes large with light-filled, contemporary, hip spaces and edgy details. The mere 1,336 square feet function beautifully and feel spacious! 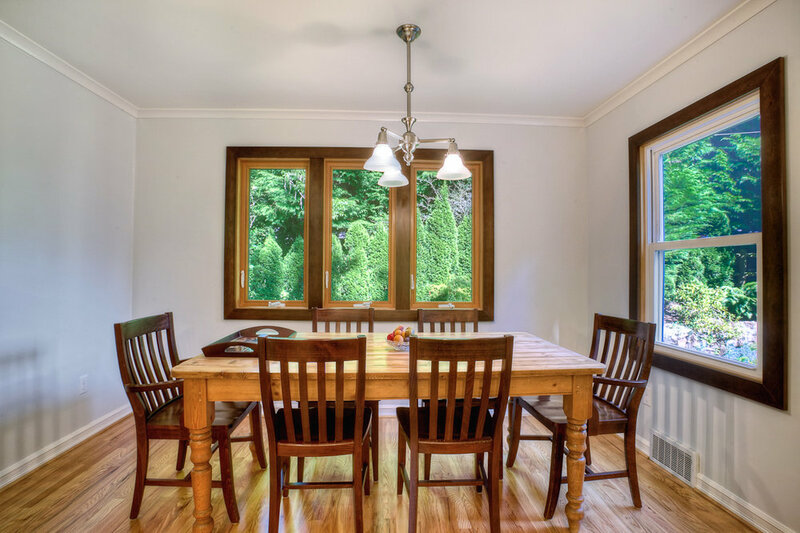 The focus of this complete remodel was on restoring or recreating accurate historical elements of this 1900 Queen Anne Craftsman, including custom interior moldings and floor inlays. Dropped ceilings were recaptured and a custom library was built into the den to create spaces with both volume and character. The exterior of the home was restored to match archived photos. The dilapidated garage was torn down for a new, insulated and heated two-car garage. The kitchen was renovated from the framing to provide a better use of space and to incorporate modern conveniences such as a dishwasher, gas range, new utilities, and better ventilation. The eating nook was redesigned with built-ins. For the attic remodel, both sides of the center were dormered to add a sitting area and bathroom. 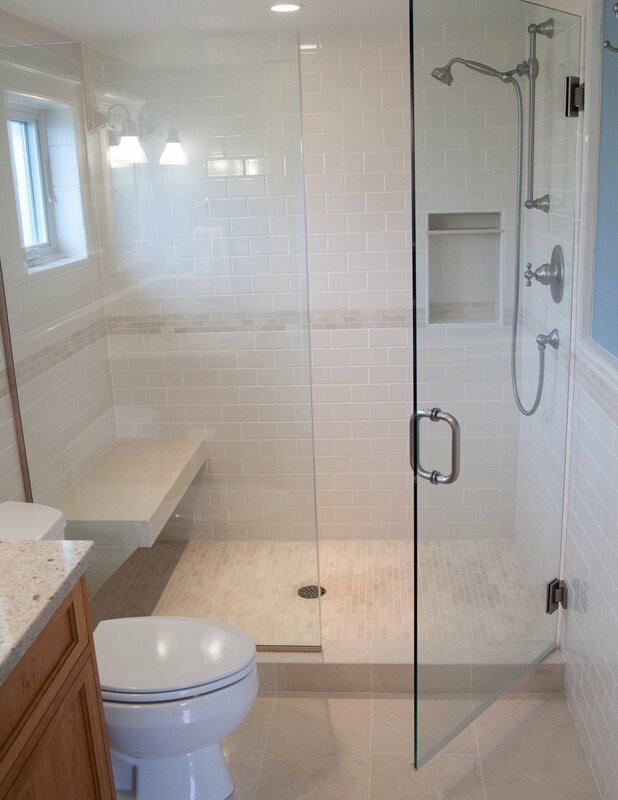 Most of the original T&G paneling was reused in the new bathroom; built-ins were used to maximize space. 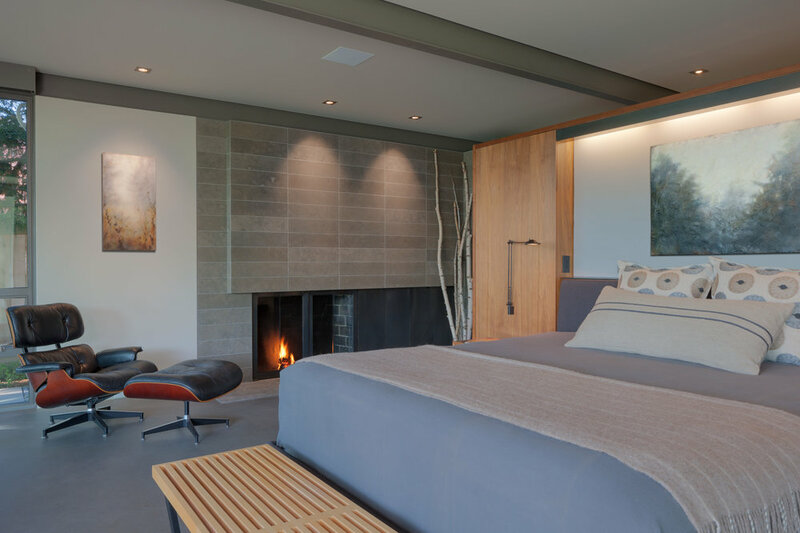 Named the Northwest Idea House of the Year, this extraordinary home features five bathrooms, an open floor plan, and an on-site design showroom. 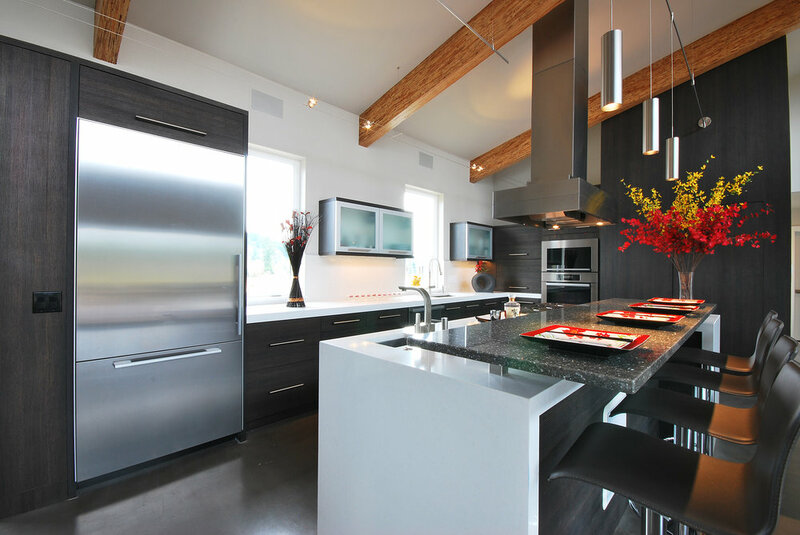 Featuring a Northwest Contemporary style with a Japanese flair, this is also a design/Built Green demonstration home. The Japanese Onsen spa is tied to a waterfall entry feature. Other special features include a 24-foot Nana Wall indoor/outdoor design and grand open floor plan living area, which are aesthetically interesting while being functionally and environmentally advanced. A sophisticated master bathroom and organized home office were created with a dormer addition to this 1931 brick home. The home was opened up using the existing closet and attic space to create the new rooms. 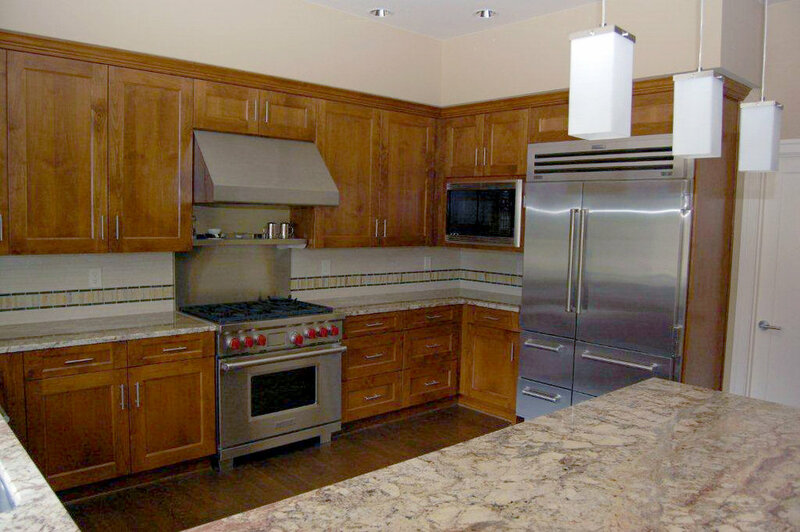 The addition features custom cabinetry, granite countertops, creative tile designs and fir floors. The exterior Hardiplank shingles are painted in natural hues to compliment the brick color tones. Completely integrated, the new dormer looks as though it has always been there. A more accessible living space with breathtaking views of Lake Washington was achieved by removing the wall between the kitchen and dining room in this lovely French chateau, creating a large open space. The wall between the living and dining rooms was also removed to access a gorgeous view of the lake with French Doors leading out to a brick patio. All new hardwood floors and a pantry/command center completed the downstairs transformation. On the third floor, a spacious master suite was created with barn doors and transom windows. This Mount Baker residence needed a complete kitchen remodel incorporating a new powder room, window seat, pantry, and home workstation. The unique island countertop highlights this well-appointed kitchen. The project also features a newly rebuilt sunroom off the living room. 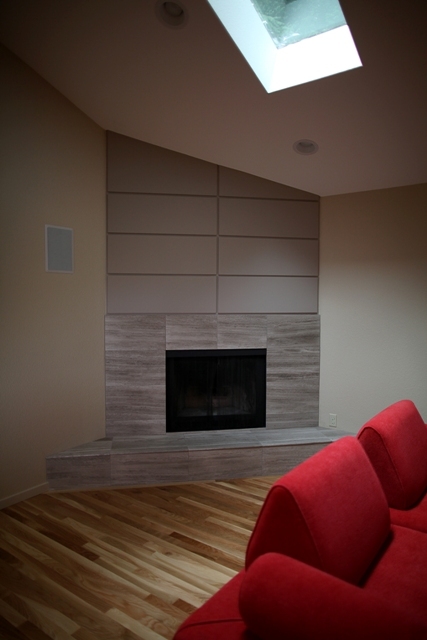 LZL Construction worked with the architect and homeowner to negotiate a well-budgeted and -scheduled project. 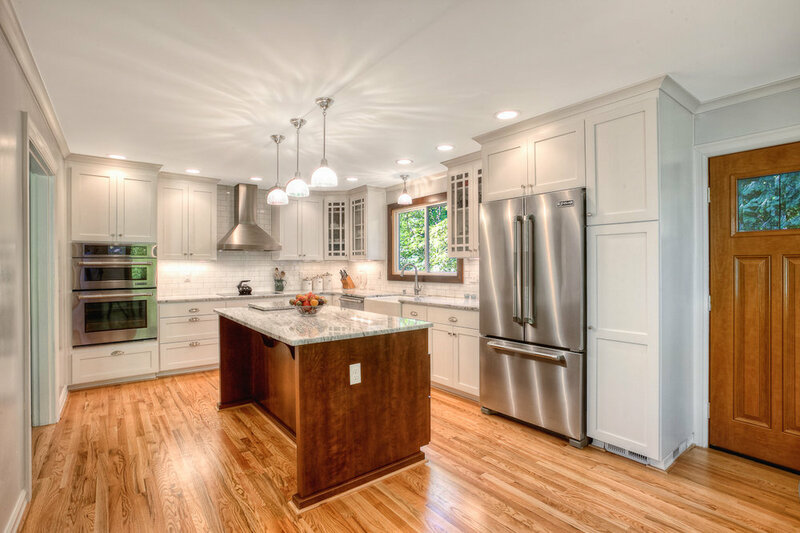 The owners appreciated the process and love their newly renovated kitchen and sunroom. This Newport Shores project included new windows, siding, roof, hardscapes, and landscape, along with new interior finishes, changing painted woodwork to cherry, and many new amenities. Newly added space included a two-car garage addition to the existing garage with a bonus room added over the now four-car garage. LZL Construction Inc.’s design/build team worked with the homeowner to design and negotiate a well-budgeted and -scheduled project. 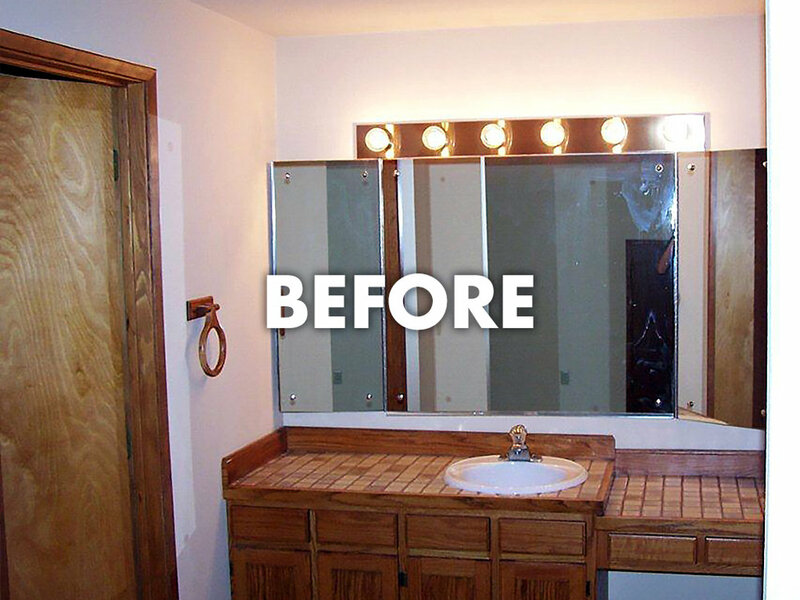 The owners appreciated the process and love their newly renovated home. The whole house remodel of this beautiful 1960s waterfront home in magnolia includes a new, modern kitchen, living room, master suite and powder room. 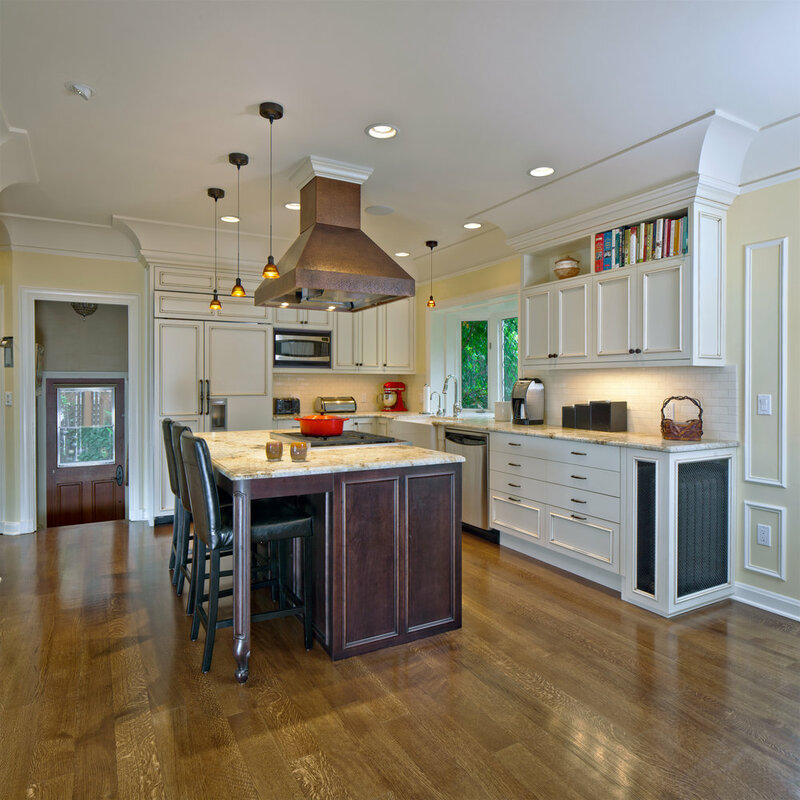 It features millwork, doors, custom closets, floor coverings and finishes. The 15 foot fireplace, formerly bland and dated, now adds new vibrancy to the residence. 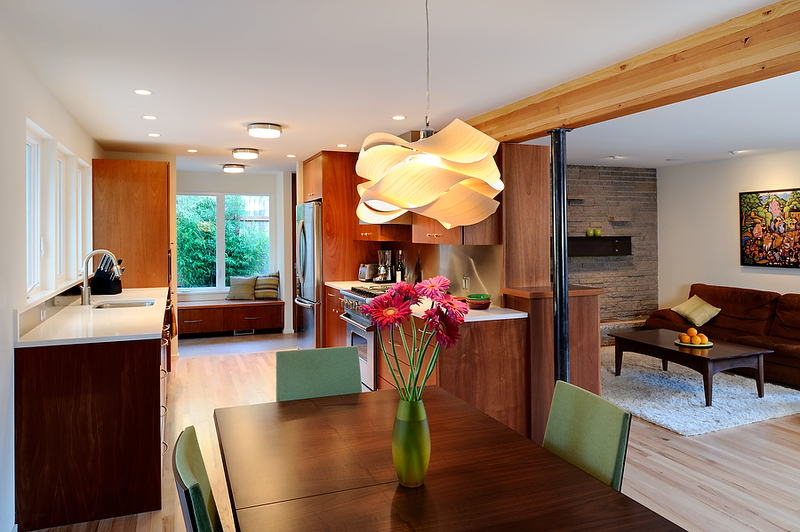 Keeping the original footprint of the home, this remodel reveals new functionality and charm. Original construction and finishes were still intact when the new owner took possession of this 1981 home. Our challenge was to update and open up the 2,200-square-foot living area to better suit modern family lifestyles. A new great room concept with an open living, dining, and kitchen area created an upscale, yet comfortable main floor. The new orientation of the family and den area provides useable and efficient work and play spaces. The style is comfortable, warm, and modern. This post-modern 60s equestrian ranch house is being reorganized from the inside out to become significantly more functional and energy-efficient. The butterfly roof system was extensively repaired, insulated, expanded and finished with a warming tone to add a feeling of cozy warmth to the home. Natural light floods through new, energy-efficient trapezoid windows. Stone, wood, and mosaic glass is reflected in professional fixtures such as cable rails and glossy cabinetry that rise from the hand-sculpted pre-finished maple floors. Phase one of three is complete. This 1954 ocean view home was almost completely gutted and given new, beautifully open spaces for the family-oriented owners to grow in. The outdated and separated kitchen was transformed into an elegant hub for the family to gather in and enjoy stunning views of Puget Sound. The new master bathroom with its lovely daylight, subway tiles, and bamboo flooring adds great value to the home, as does the opened laundry and family area on the lower level. The 1979 kitchen and living area of this traditional bi-level home was ready for an update. To better utilize the entertaining areas for large groups, the kitchen, dining room, and living room were regarded as one large space with design details carried throughout to create a harmonious, congruent room. The aesthetic goal was contemporary, unique, and warm, with emphasis on function. The clients were fun, sophisticated, and social, and the husband loves to cook! This unique outdoor structure offers a working garage space and an area for relaxed outside entertaining with seating, cedar soffits and beams, poured cement flooring, and gas service for the barbecue. The deluxe garage has a car lift to allow parking for two cars. Furniture-grade plywood in cedar-tone stain lines the interior walls of the garage space. Classic finishes paired with commercial materials produce an eclectic, fun vibe. This small 1948 Craftsman home was busting at the seams with a growing family, pets, and every room small enough to keep the family tripping over each other. 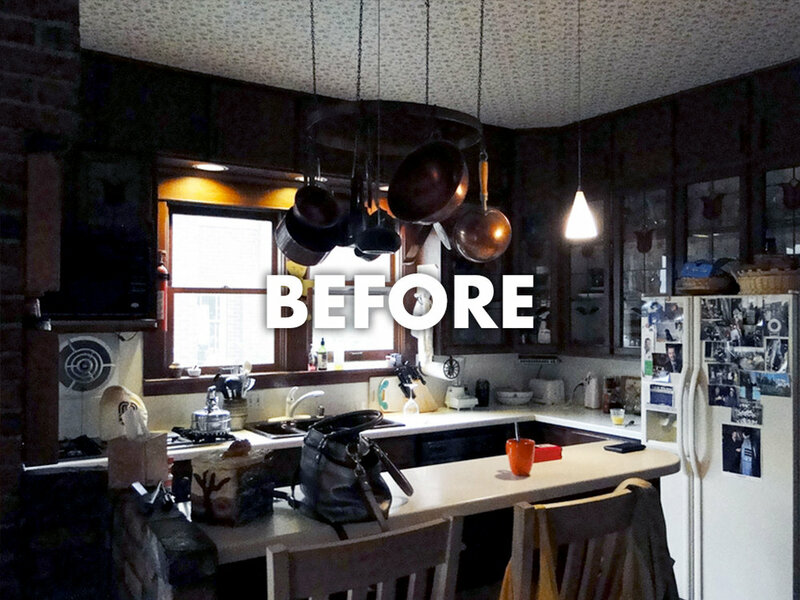 The remodel turned this tiny closed-in kitchen into an open, central eating/working hub with a 200 square foot kitchen addition into the large backyard. Undoing an existing pantry space turned a dangerous and gloomy stairwell into a welcoming space that now connects the downstairs with the main floor.